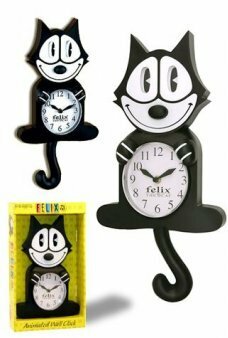 It’s the classic Felix the Cat animated clock! Felix’s eyes move left and right while he swings his tail back and forth!.. 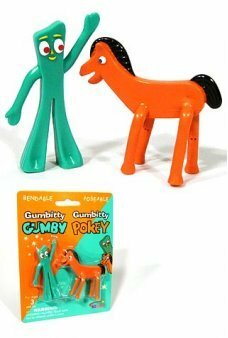 Hey Kids, Gumby and Pokey and the whole gang are here! Our Gumby & Friends Set includes Goo, Minga, Gumby, Prickle a..
Felix the Cat, the fantastic femine feline animated clock in Pink! Girl Felix’s eyes move left and right while she..
Biff! Pow! Batman! Here is the original 1966 Batmobile from the classic TV show with bendable Batman and Robi.. 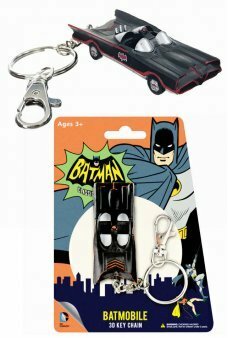 Here is the original 1966 Batmobile from the classic TV show on a metal key chain. This detailed plastic car featur..
Hey Kids, Gumby and Pokey are here! 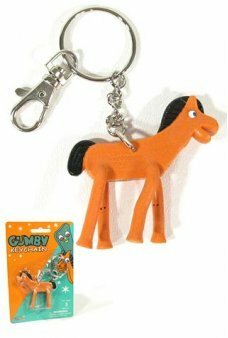 Now you can bend and pose the original happy soft green friend and his orange horse ..
Gumby would like to hang out with your keys! 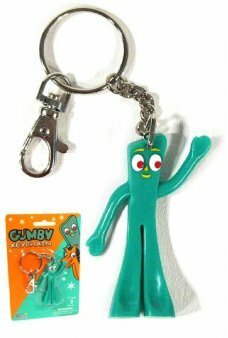 Now you can bend and pose the original happy soft green friend on your keyc..
Pokey is Gumby’s good friend and he would like to watch your keys! Now you can bend and pose the original happy soft ora..
Hey Kids, it's the whole Simpsons family as bendable play figures (like Gumby)! 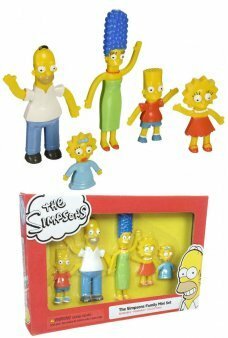 Our Simpsons Mini Set includes Home.. Carry our classic Felix the Cat character with your keys in your bags of tricks! You can pose Felix’s arms, legs and ta..
D'Oh, it's the Homer Simpson as a large bendable play figure (like Gumby)! Homer is the perfect loveable Dad from .. 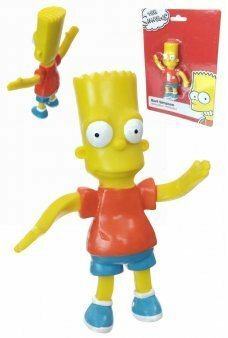 It's the Bart Simpson as a large bendable play figure (like Gumby)! 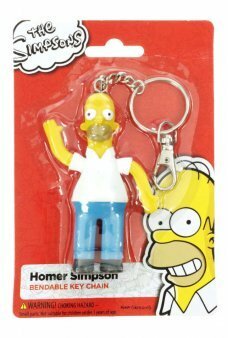 Bart is the impulsive child from the classic T..
D'Oh, it's the Homer Simpson as a bendable play figure on a Key Chain! 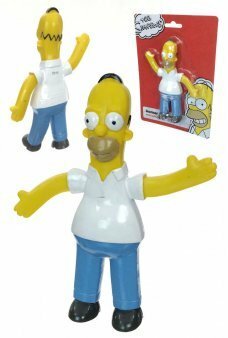 Poseable Homer is 4 inches tall with a 3" silver .. 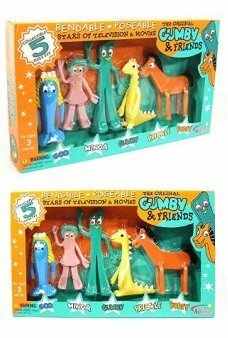 The 50th Anniversary edition of Gumby and Pokey are miniature versions of the originals! Now you can bend and pose the o..
Pose the original Wonder Woman into super hero action. Just bend her knees and elbows to place Wonder Woman into adventu..
Pose the original Wonder Woman into super hero action on your key chain. Just bend her knees and elbows to place the min.. It's a bird, it's a plane, it's bendable Superman! Pose the original Superman with his red cloth cape and blue tig.. It's the caped crusader, it's bendable Batman! 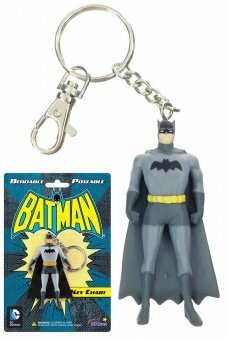 Pose Batman into super hero action on this metal key chain. Just be.. It's a bird, it's a plane, it's bendable Superman! Pose Superman into super hero action on this metal key chain. J..
Batman! It's the Caped Crusader as a bendable figure from the classic 1960's TV show. Pose the original TV B.. It's the Joker, Batman's archenemy! 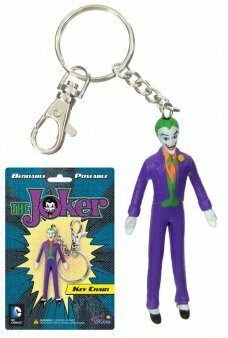 Pose the Joker into prankster action on this metal key chain. Just bend his ar.. The Joker! It's the Batman's arch villian as a bendable figure from the classic 1960's TV show. Pose the ori.. It's Flash as a bendable and poseable figure. Bend the arms and legs of the fastest human, the Scarlet Speeder. &n..
It’s a mini Gumby! Now you can bend and pose the original happy soft green friend into action poses. 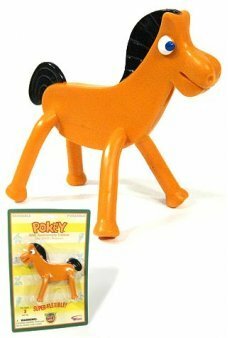 Gumby first appeare..
It’s a mini Pokey, Gumby’s orange pony! 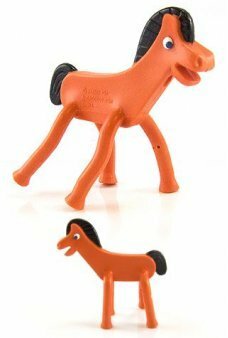 Now you can bend and pose the original happy soft orange friend into action pose.. 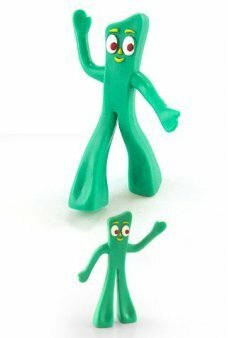 The 50th Anniversary edition of Gumby in his original size! Now you can bend and pose the original happy soft green frie.. 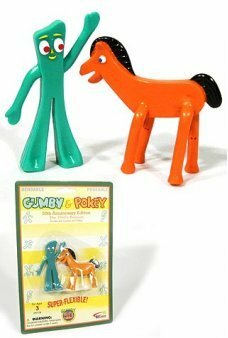 The 50th Anniversary edition of Gumby’s best friend, Pokey in his original size! Now you can bend and pose the original .. The Blockheads J and G are always making mischief for Gumby and Pokey. Now you can bend and pose the original red blockh..
Our Felix the Cat has a mischievous smile and a yellow Bag of Tricks! 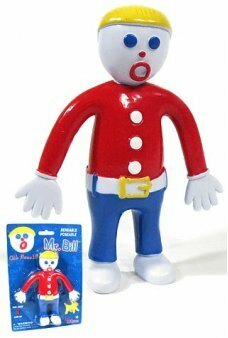 You can pose Felix’s arms, legs and tail to expres..
You can still hear the high-pitched cry – “Oh no, Mr. Bill!” Sure, it has been 40 years since Mr. Bill debuted as a feat..